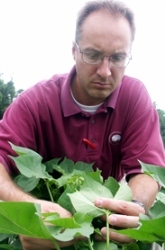 This presentation will help consultants, growers, and other practitioners in the southeastern USA identify, scout for, and manage the kudzu bug in soybeans. The original research being conducted in this region is of great importance for stakeholders in the Southeast, but it will be of tremendous value when this pestiferous species invades other portions of the country that grow many more acres of soybeans than grown in the Southeast. Research conducted to date has made it clear that the kudzu bug can cause considerable losses in soybean if not controlled and is a pest species that must be addressed in infested areas. Specifically covered in this presentation are the history of the distribution of the insect in the USA, identification of the life stages of the species, data demonstrating potential yield losses due to the insect, expected control with insecticides, and tentative treatment threshold recommendations. By the end of this presentation, the practitioner should know how to identify the kudzu bug, recognize the various life stages, and have a much better understanding of how and when to control it in soybeans.